Preheat oven to 350. 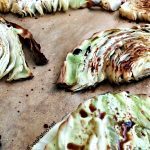 Arrange cabbage slices on a parchment paper-lined baking sheet. In a small bowl, combine pepper, salt, and chili powder. Sprinkle the mixture over cabbage slices. Drizzle ghee overtop. Roast for 20 minutes. Drizzle balsamic vinegar overtop and continue to roast for another 10 minutes or until cabbage is soft.